The process involved with planting large, mature trees is very similar to that of planting small form plants. It simply requires a larger hole. A much larger hole. The tree was in a 48 gallon pot, and required a planting hole that was 8 feet across by 1.5 feet deep. The project began with an initial site visit to meet with the clients to determine the exact location of where to install the tree. The crew took soil samples to determine if any amendments needed to be made to the soil, to improve overall tree health. Once a baseline for the project was established, the crew measured a very precise 8 foot diameter circle, and began the digging process. Once the hole was complete, the tree was carefully eased into place and centered. The crew then back-filled with the existing soil and additionally with some organic compost. 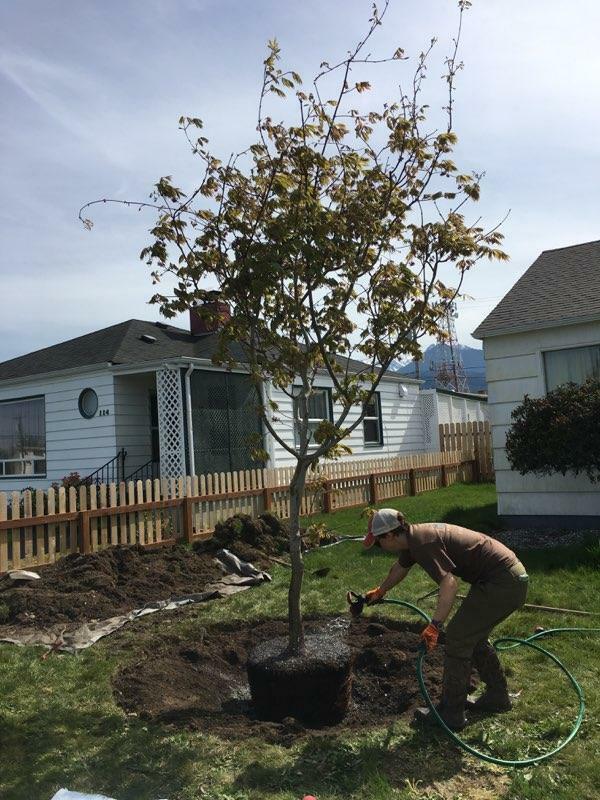 Once the hole was filled, the soil was lightly tamped to secure the tree in place, while making sure not to compact the soils too much. Trees need un-compacted soil with plenty of large pore spaces for roots to grow properly. By compacting soils, pore spaces are reduced, and trees can “suffocate” without adequate oxygen. The water-holding-capacity of compacted soils is also much lower than un-compacted soils, which can result in less available water for trees and other vegetation. 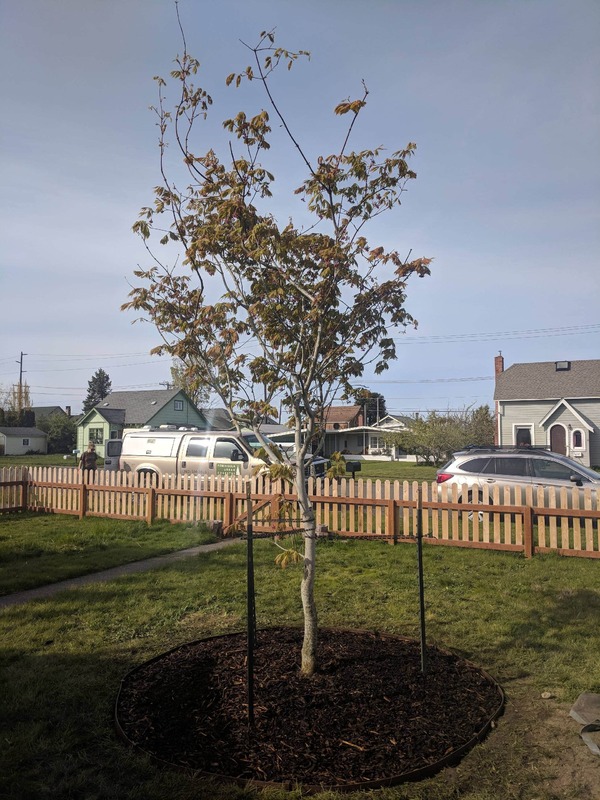 Three support posts were installed, along with with tree-chain, an expandable plastic chain that helps hold the tree upright in events of high winds. 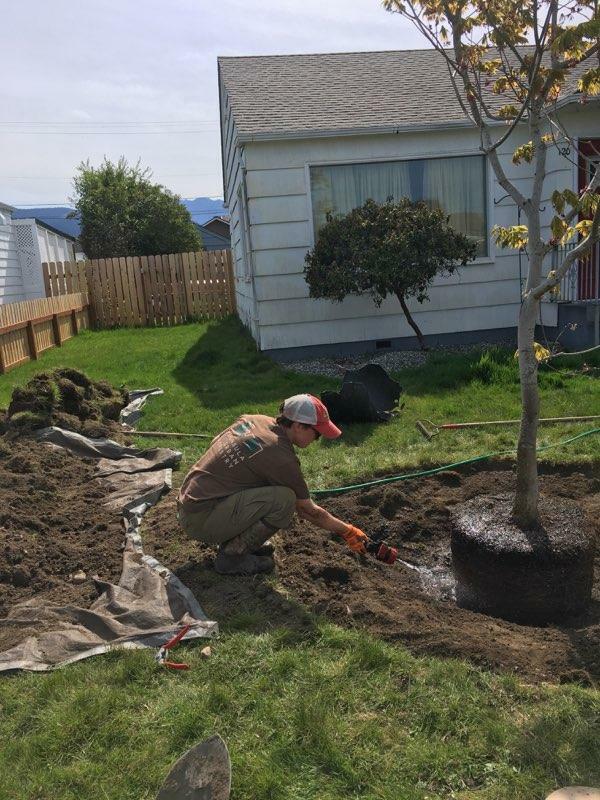 This is typically recommended on large tree installations until it has established new supportive roots, which usually takes 2-3 growing seasons. 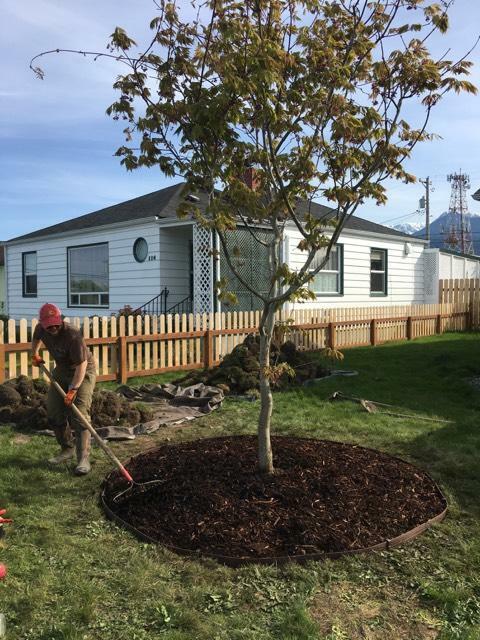 A layer of woodchip was added as a final touch to retain moisture in the soil during the hot, dry months, and to reduce competition from weeds and other undesirable plant species. It also creates an aesthetically pleasing look!